We at Paris Walking Tours would like to introduce you to one of the most beautiful cities in the world. Paris is made for walking. Surprisingly compact, the sights of Paris are best seen walking. Our Private Guided Walking Tours are friendly, in-depth excursions visiting the great Paris attractions and monuments while keeping an eye out for those glimpses of everyday Parisian life that define the spirit of this City on the River Seine. From the monumental architecture to the flower stalls of the local market, the sights of Paris stimulate the senses and invite a closer look. 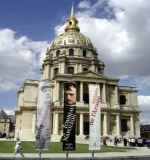 We at Paris-Walking-Tours.com are all native English speakers, well versed in the history of the city and French culture. Always attentive to our client's needs and interests, we tailor your tour with these in mind. Our fees are very reasonable, making a personal tour guide affordable to all. Our walking tours are private, for your party only. Our services are geared toward couples, families, small groups or individuals and are sensitive to the needs of children and seniors. A personal guide for your first days in Paris allows you to take in the sights without the stress of navigating a strange place while becoming familiar with the important practicalities of this great world capitol. With our very popular Introduction Tour, Paris becomes a wanderer’s back-yard. This tour gives a great overview of the City, visiting many of the most famous sites and answers the questions that many first time visitors have about Paris. We'll supply you with the information that will make your Paris vacation more enjoyable. Our Paris-Walking-Tours.com pages are loaded with practical information on things to do in Paris, French Culture, and Paris photos, inviting you to begin your Paris visit now. Getting Along page for insights to French Culture and Customs. A good beginning is what we provide at Paris Walking Tours. If you have questions about any aspect of your Paris Visit, use our Contact Us page and Paris Walking Tours.com will quickly answer your question.